We are extremely pleased to own this truly magnificent male! He has an extremely friendly disposition and passes that along to his cria. If you want tiny, twisted, consistent, independent ropes of fiber dripping with luster on your crias, you'll want Martinie with a Twist. Twister's long, drapey, pencilled, independent locks and blinding luster can't help but impress everyone that lays eyes on him, including the judges. Georgie was born a bit early - about 28 days earlier than I'd expected, in fact! - but was fully developed and ready to get on with living the day she was born. She's a lovely gal, with very long legs, dark doe eyes and exquisite fleece that barely hints at fawn although when its luster catches the sun it deepens the shade by a tone or two. We elected to use Georgie to bring in the Ramillo/Baron genetics with her first breeding by using our champion male, Suri Lane Lucien. With her spun sugar sweet personality, her delightful femininity and her excellent proportion, we believe Georgie will be a wonderful production female. 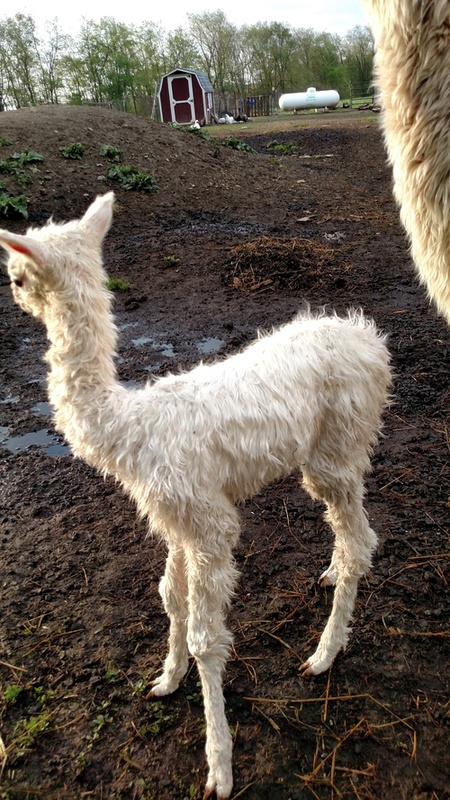 On April 16, 2014, Georgie delivered a lovely white female cria sired by two-time champion Suri Lane Lucien. In 2015, she delivered an awesome light fawn male, and in 2016 she gave me a stunning white female. This brings in new and notable genetics to our herd of outstanding white suris. She was exposed this summer to Ramses, our new young fleece champion fellow. Firelight is a sweet young female sired by an awesome, multi-champion suri macho, out of my favorite suri female. She shares her mom's femininity and poise, and bears excellent fiber from her sire. Martinie (her sire) has phenomenal fiber stats even in age, a quality that I hope he has passed along to his daughter. Firelight was bred last fall to our Mushu. A sonogram done 3/11/19 shows that she has conceived.